Three Scenic and Exciting Michigan Railroads! 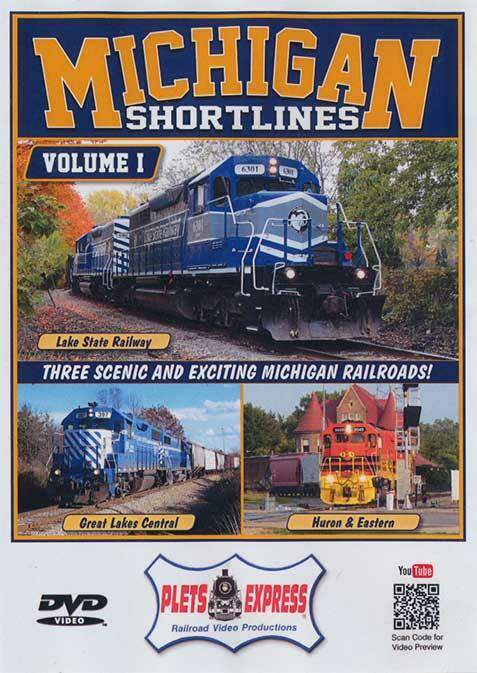 Featuring shortline action from three great Michigan Railroads including: Lake State Railway, Huron & Eastern Railway and the Great Lakes Central Railroad. This exciting pure Michigan train action includes road freights, locals and switching, with numerous trains radiating out of the rail hubs of Bay City, Saginaw and the train action Hot Spot of Durand, where you'll also see a few Canadian National and Amtrak trains. Plus small town rail action, beautiful Michigan scenery and runbys past several historic Michigan depots. Diesel power consists of: GP9, GP35, GP38, GP38-2, GP40, GP40-2LW, GP40-3, SD40M-2 and SD40-2. Rail footage era 2014-2015.
charley mann (Little Mountain, SC) on 2016-04-13 17:20:46. Just received this program, and it's a real winner. Lots of interesting motive power, including a few CN Cowl units and H & E SD40M-2's, GP40W'S Along with GLS GP35's with Alco Trucks. Much to enjoy, especially action at the Beautiful Passenger Station in Durand, Michigan. A great addition to any video library. Al Wernert (Owosso, MI. US) on 2016-12-10 14:11:40. Very nice video showcasing three Michigan shortlines. Many of the scenes show Michigan's colorful fall foliage, that really makes the scenes a joy to watch. A very good variety of shots detailing mainline, local, and yard operations. Narration is very good overall. Highly recommended.